Mildly surprising now, but it was coming eventually. Saw it coming miles ahead, tbqh. Their ultimate dream of performing at the Tokyo Dome was finally coming into fruition, something big has to happen there, right? 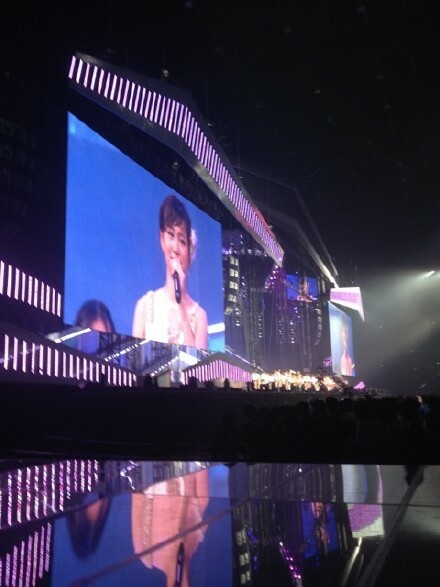 Something like a graduation for 1st or 2nd gen, maybe Acchan, Mariko, Yuko, or Sayaka. Turns out it's Acchan. But damn this is still hard to swallow. I just hope this doesn't start a string of graduation announcements from the others as the Tokyo Dome concert looms closer. I don't want the Tokyo Dome Concert turning into a bigger sobfest than it already will surely be. AKB can only afford to lose its pillars one at a time. 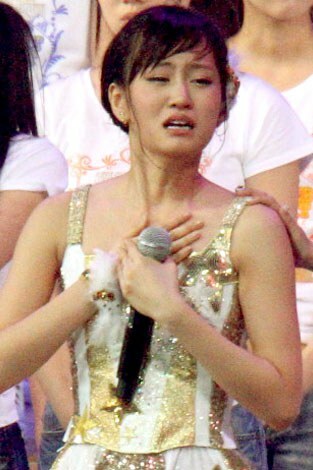 i can't imagine AKB without acchan.. I was stopped by many people, but today I made a decision to announce something to everyone. I'm sorry I frightened you, I still want to deliver a happy face to everyone. I am a first-generation member and have been here since I was 14. This was my life. It was a big decision. And I will make a second important decision. I am going to graduate. I have caused some troubles because of my mood swings, but thanks for everyone's help, I am here today. 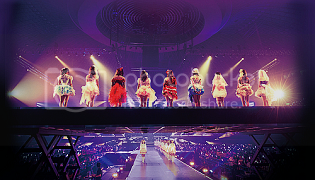 To perform in Tokyo Dome was a dream since I was 14. Now this dream has come true, at 20 years of age, I have to work hard towards my next dream. I have worked hard for the past 6-1/2 years. I have to move onto my next dream at the age of 20. I am anxious and worried because I don't know what will happen. But for the kouhai, I have to take the first step towards this. No details have been decided. - Announcement before Mayu's birthday --> Mayu is the next face of AKB48? - Announcement after Jurina's transfer --> Jurina is the future of AKB48? 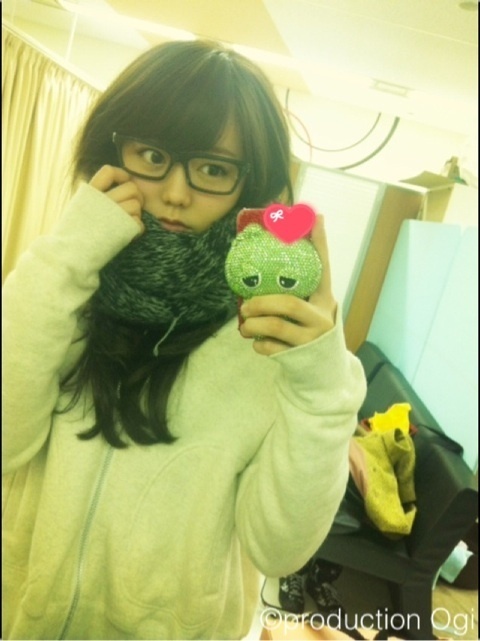 Acchan... She's the first reason I fell in love with AKB48 last year... Man, too many emotions stirring inside of me. I know this is going to happen but not expecting it to be this soon. Whatever it is, I hope for a better success for Acchan in her other career. Ahhhh shucks. 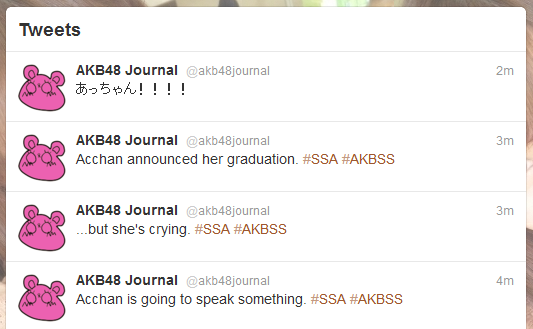 I was expecting a graduation but I didn't think it was gonna be Acchan, it's upsetting and somehow not really. She only 20! She's got plenty more years to develop career! Why the Dome as final endpoint?!?! More importantly, what's gonna happen to akb48?? We don't want to see another Humpty Dumpty like MAX, SPEED, & MMusume, who had their great falls & can't be put together again.